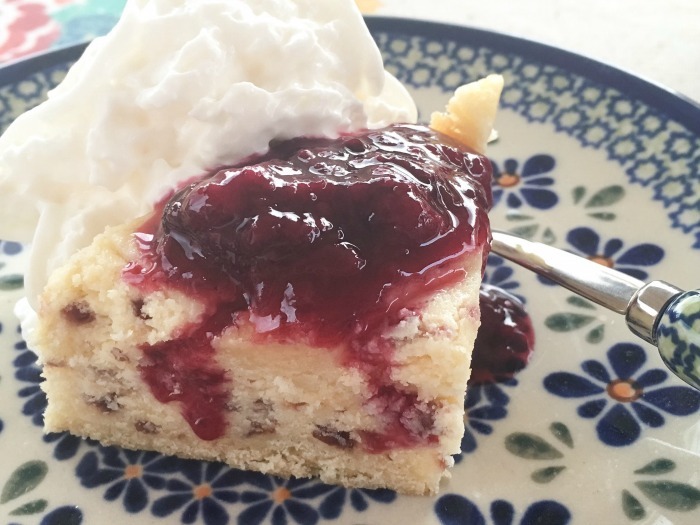 Polish Cheesecake, sernik, is a classic. You’ll find it in every restaurant, cafe, and coffee shop in Poland. 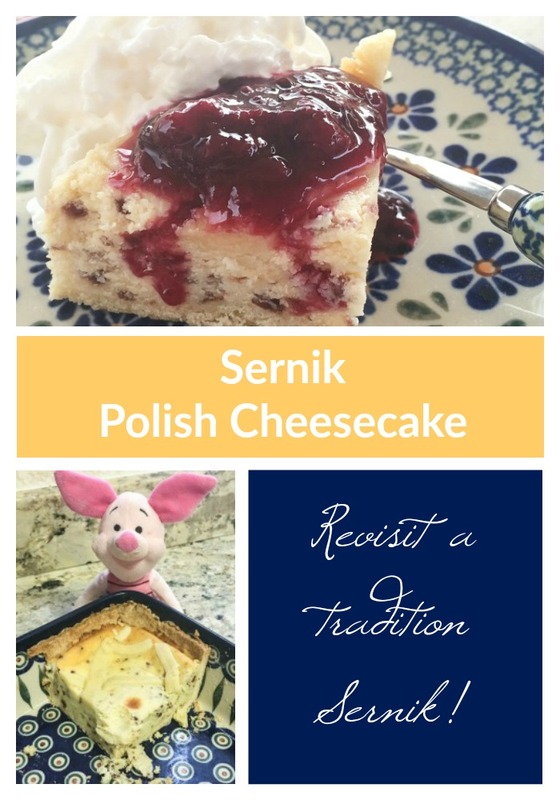 So just like szarlotka, it surprised me when I realized that I’ve never made a Polish cheesecake! Until now! 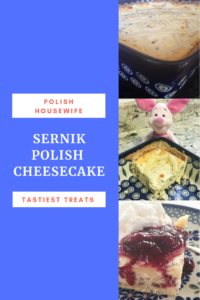 🙂 I looked at several recipes in English and in Polish, on the internet and in my collection of Polish cookbooks, and this cake is a compilation of those recipes, and a little bit of winging it. In my study of sernik, I can say that twaróg, the Polish farmer’s cheese is the only constant, and most recipes call for two pounds or 1 kilogram of twaróg. 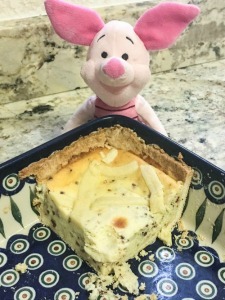 I found that this cheese is super easy to make, and that I love the taste and will be making it again. 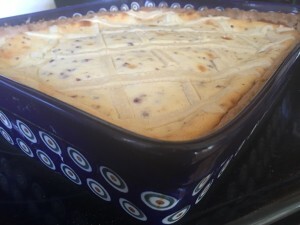 If you’re using my recipe for twaróg, you’ll need a triple batch to make this cheesecake. One of the first choices you’ll have to make is what kind of crust to use. I made the short-crust pastry found in this recipe on About Food. I’m sure that it is very traditional and it was tasty, but I don’t know that I’ll use it again. I’m an experienced maker of pie crust and I found it difficult to work with, especially in the size I needed to line a 9 x 13 pan. I ended up making slabs for the bottom and sides and piecing it together. If I want a pastry crust in the future, I’ll probably try something else. But in all honesty, I suspect that the next time I make this I’ll do a cookie crumb crust, maybe a digestive crumb crust, with just a wee bit of sugar. It’s a more modern spin on the traditional recipe, but it would be so much quicker and easier. I realize the dichotomy in making my own cheese and looking for a quick and easy crust; it’s all about the effort in relationship to the benefit. I’m willing to go the extra mile, but only if the difference is noticeable. As for the body of the cheesecake, it can be plain. It can be flavored with citrus zest and extract or candied citrus peel; it can have raisins and might even include mashed potatoes. The key differences that I see between sernik and a typical American version of cheesecake is that it has much less sugar. You’ll really taste the cheese, and it uses less other dairy, like milk and sour cream, making a stiffer mixture. Sernik might be topped with a lovely chocolate ganche or a layer of berries in gelatin, or it may be served au naturel. I opted for a sauce made with a 12 ounce bag of frozen berries, a couple tablespoons of sugar, and a teaspoon of lemon juice and 1/4 cup of water. I simmered until the berries were breaking down and thickened with two teaspoons of corn starch dissolved in a 1/4 cup of water. I’d love to hear how you personalize your sernik. 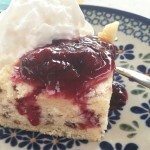 A traditional Polish cheesecake, you’ll notice the cheese in this cheesecake. This is a dense cheesecake. I like to serve whipped cream along side to lighten it a bit. This does sound amazing, Lois – the texture looks so different, too. This will be a good winter project for me – making the cheese, then making the cake! Good eye, David. Yes, the texture is different too. I’ll be eager to hear how yours turns out. I haven’t tried freezing them, Bev, but I have read about doing so on a Polish food blog. The author recommends slicing into portions and freezing on a cutting board before wrapping in foil or placing in individual containers. Her preferred method for defrosting is in the fridge for a day, although on the counter seems to work if the spot isn’t too warm. The worry about quick defrosting is that the cake will get watery. The best texture will always be while it’s fresh, but this is an option to keep things from going to waste or to have sernik when you know you won’t have time to bake. 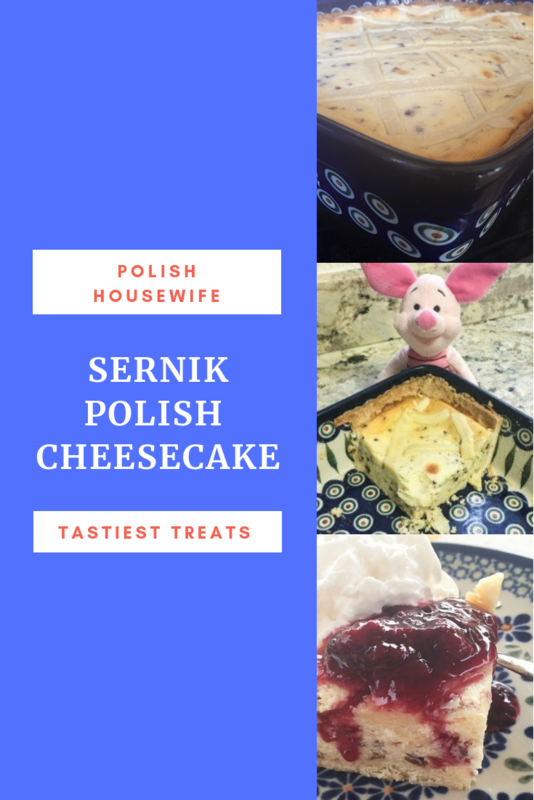 I took a polish baking class with my son and polish cheesecake was one of the items we made. I did not care for the texture of the farmers cheese but we did not process it to make it smooth. Maybe I will try it again. That’s great, Denise! Our youngest daughter and I took a baking class when I went to visit her in college. It’s the people you share it with that make food fun. I just finished making my cheesecake for my daughter’s birthday. Her request was for babcia’s cake with my filling. So a little adaptation. I love the twaróg, childhood memories. Sto lat to your daughter! Oops, I see what you mean, and I’ll correct. I think I went with one cup in the filling.